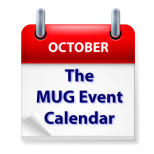 MacOS X High Sierra is the hot topic on this week’s MUG Event Calendar, with two groups listing it as their primary topic. Bob “Dr. Mac” LeVitus will be making an annual visit to an Illinois group, and Adam Christianson will talk iOS 11 to a California group. Chicago Macintosh Users Group – Bob LeVitus live and in person!